Posted by elizabethwong in 1. Congratulations to all those fine lawyers who worked on the habeas corpus case. Be at Shah Alam High Court 3.30 pm to greet a free man! 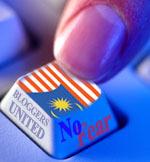 Posted by elizabethwong in Current Affairs, Democracy, Human Rights, International, Malaysia, Politics, Race Relations. Finally, something to cheer me and my office! Thank you America, for voting for change we can believe in! There I was, wading in chicken dung, while being surrounded by irate residents and MP for Kuala Selangor Dr Dzulkifli Ahmad to check on a ‘smelly’ problem, when SMSs started to come in. Those SMSs threw me a little off-guard. But I thought it best to find out the details later in the Hansard, as the residents were close to baying for the blood of the organic fertiliser representative. It was only this morning I saw the misleading statements uttered in Parliament and published in all major newspapers. Unfortunately, I am not an MP and have no recourse to reply or demand for a retraction. And it will forever be in the records of the Hansard. I can only imagine the MB and Big Boss reading the articles and shaking their heads. Azalina owes me a public apology, or else she will be referred to the House Committee of Privileges for official censure. I am aghast by the false statements made by the Minister for Tourism, Azalina Othman during Question Time in Parliament on Tuesday 4 November 2008, which were aired live on RTM1 and reported by major newspapers and blogs today. For the record, I was present at the Ministry’s launch of ‘ZOOM’ where Prime Minister Abdullah Badawi graced the event. The Exco for Tourism from Kedah, Penang and I even had the opportunity to speak to the Prime Minister, who was seated on the next table. The Minister challenged me to prove that I was never invited to Pulau Carey in her programme there (Berita Harian, 5 November 2008). Allow me to state publicly that I was never invited to Pulau Carey by the Minister. In fact the Minister herself has never stepped foot officially on Pulau Carey. In Selangor, the Minister has visited the following sites – Batu Caves, Pulau Ketam and Royal Gallery Klang. On those occasions, I was left out on purpose, whereas by convention, I should have been informed to host or to to accompany the Minister. Similarly, I have never received an invitation to programmes organised by the Selangor Tourism Action Council (MTPN-Selangor). It is an open secret that since the Memorandum of Understanding (MoU) between the Ministry and state governments was cancelled after the General Elections, and with the chairmanship of the State Tourism Action Councils in the 5 Pakatan Rakyat states relegated to BN officials, there has been very limited communication and cooperation of the Ministry with Pakatan Rakyat states. Even the General Manager of the Selangor Tourism Action Council, when invited to meet me for discussions on tourism matters, was too frightened to meet officially. In the end, he only spoke to me on a personal basis. The disconnect between the state governments and State Tourism Action Councils is glaringly unproductive and unhealthy for the nation. Further, the signal sent to the tourism industry is extremely negative and jeopardises the tradition of close collaboration of the state government with related government agencies. I do not wish to prolong this unnecessary protracted war of words with the Minister. It has been 7 months since we took office, and the Minister should be looking into revamping the current communication channels to foster closer and productive ties with state governments. To carry on in this current mode of operations and communications is detrimental to the nation. Nonetheless, Pakatan Rakyat states’ Excos on tourism will continue to soldier on despite the odds, as we are mindful of the national importance of tourism to the economic health and wealth of the nation. Tourism is a national agenda and all parties should be mindful that success in this sector needs proper official channels and access to plans, programmes and decision-making by the state governments to the Ministry of Tourism. Political interference serves only personal agendas. To this end, I have from very beginning, instructed state officials, including local councils, to cooperate fully with the Ministry of Tourism. I call on the Minister to apologise publicly as her statements, assertions and insinuations have gravely affected my credibility and that of the Selangor state government. Failure to do so will compel me to refer the Minister to the House Committee of Privileges for censure. Former defacto Law Minister Zaid Ibrahim resigns as Senator, at the behest of the BN government. Which goes to show, reforms will never happen under Umno, whether it’s led by Abdullah Badawi, Najid Razak or Mickey Mouse.